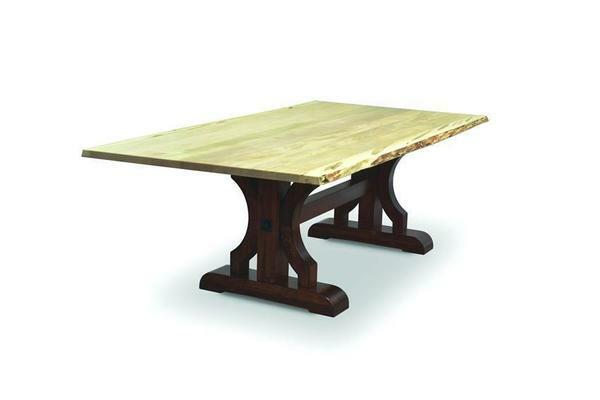 The Amish Barstow Dining Table with Live Edge puts together a stunning live edge top and trestle base for an unforgettable dining room experience. The base is thick and rich with a design that shows off the artistry of Amish woodworking. Each Barstow that's made is unique with the unpredictable live edge wood defining the top. Live edge furniture has a natural appeal and features the edge of the wood that's right beneath the bark. Live edge is rustic and rugged, but also works in a contemporary setting. DutchCrafters is proud to offer authentic Amish made furniture with the custom features you select. Please email or call our team today with any questions.